Homemade Pepperoni Pizza and the value of face-to-face conversations in the kitchen. When my Husband and I were expecting our first child, we had many conversation about how we will parent and what kind of parents we want to be. What values we want to bestow upon our child and eventually more children. Some of them changed with time but some of them remained as our initial goals. We strive every day to make them happen and continue it. One of my goals as a mom and a homemaker was to make home cooked meals and involve our kids in the preparations. I want my girls to know how to cook and bake and not rely on store-bought or take-out meals. Communication is so important in raising kids. Face-to-face communication in the kitchen is also fun. Children watch us even when we don’t know it. They watch and learn. They soak the knowledge like sponges. It’s amazing to watch them learn. Sometimes, they will surprise you by showing you what they know. My two-year old knows how to place pepperoni on a pizza. He knows not to crowd the slices and to place it all in a circle motion. He loves doing it and we always make sure to praise him for it. Many cookie recipes I share here on the blog, especially the cut-outs, were made with my kids helping. If it’s whisking the dry ingredients or helping scoop out the dough – they want to and love to do it! Our favorite family meal is pizza. It may sound boring but it’s our favorite because it’s so easy to have everyone involved in making it. Even the youngest one (our son is 2 years old) can do simple things like placing toppings. But the memories we all create together are precious. Kids love to help. They love being included. Making dinner is one of the easiest ways to let them do it. It also creates bonds in the family that only strengthen it. I remember when I was 10 years old, I didn’t want to be anywhere near the kitchen. All I wanted was my books. My 7 year old daughter ALWAYS asks if she can help with dinner. It amazes me every single time and I am so grateful for this. The girls will always help placing the toppings on the pizza. With the help of their 2 year old brother, who has to stand on the table to reach the counter – they make it a group effort. We love it! So what’s my part in all of it? Chopping veggies. Yep, apparently I have some serious knife skills in the kitchen or so I have been told. 🙂 I am also the one who does the dishes afterwards, but that’s because of my goal of having a clean kitchen in the morning. Nothing can turn the day into a bad one quickly as getting up to a pile of dishes in the sink. This pizza recipe is nothing extraordinary. It’s just simple pepperoni pizza with some of our favorite veggie toppings. But the fact that we all made it together makes it very special meal for us. Our kids choose their toppings and my Husband and I have our favorites. This recipe makes 2 large pizzas, so there is lots of room for everyone’s favorite toppings. Homemade Pepperoni Pizza - learn our tricks to make the best pizza at home and how to involve the whole family in making it! 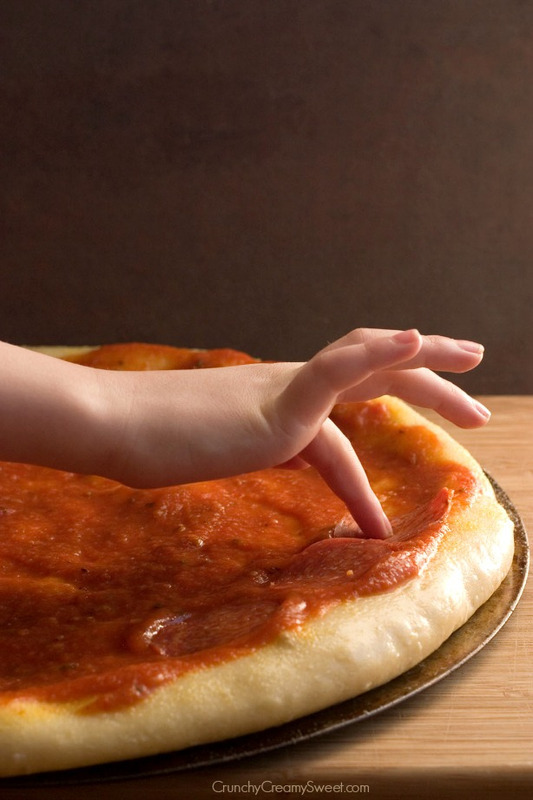 Spread one cup of pizza or spaghetti sauce over the dough. Top with pepperoni, onion, pepper, cheese, mushrooms and olives. Bake for 12 to 15 minutes, or until the cheese is melted and bubbles and the sides are golden. Repeat with the second pizza dough. This recipe makes 2 large size pizzas. There is nothing better than making your own pizza, from the crust to the sauce to choosing the toppings for your very own individual pizza. These are times that will be treasured in the years to come. Beautiful post. This is such a fantastic post, Anna. First of all, pizza is never boring! It’s one of my favourite meals. If the Husband and I are super tired and it’s been a long week, we’ll treat ourselves with pizza. I don’t make it as often as I’d like. The next time I do, I’m definitely trying your husband’s crust recipe. Second, spending time with kids in the kitchen is so important. I used to hang out in the kitchen, watching my mom bake and cook. I stopped doing it when I became a teenager but now that I’m older and wiser, I want to learn all of her amazing dishes. We always made sure to eat together as a family too. Your kids are going to have such incredible memories of this time together. I make pizza alot as well! It’s quite fun. How much oil goes into the dough? It mentions oil in the instructions, but not in the ingredient list. Thanks! Hi Becky! I am so sorry about that – the recipe is updated now. If you make it, please, let me know how you like it! Thank you! This was such a heartfelt post Anna. I loved it. Being in the kitchen with my kids is one of the things I look forward to the most when I think of having my own family. I’m also super impressed you managed to catch a photo of the pizza while it was still steaming hot! My Hubby helped me with this one. 🙂 Thanks, Courtney! 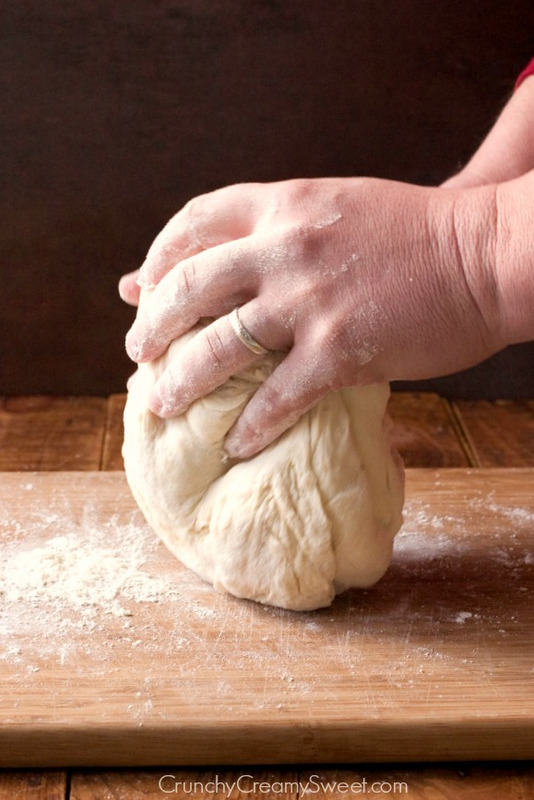 I’m still on the hunt for the perfect pizza dough recipe. I will have to try your husband’s version!